Kiffin watch: there must be a reason. Junior is still trying to defend himself on the “gas pumping” he-said, he-said debacle. … Jeffery and Calhoun County (S.C.) High School coach Walter Wilson told ESPN.com that during his recruiting pitch, Kiffin told Jeffery he would end up pumping gas for the rest of his life like all the other players in the state of South Carolina if he signed with the Gamecocks. There has to be a reason to act like a cocky SOB? That hasn’t stopped the Laner before. UPDATE: You can watch the video here, if you want. Perhaps you’ll recall this comment from a few days ago. 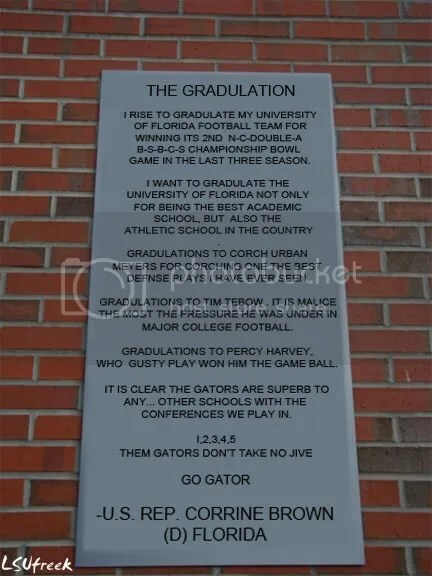 Corrine Brown’s speech goes up next to [the Tebow plaque at the Swamp] next week to complete the two most famous speeches in Gator history. Georgia: Joe Cox, Aaron Murray: I like Joe Cox. Here is a guy who came to Georgia with impressive credentials out of Independence High School in Charlotte. He redshirts behind D.J. Shockley, a guy who waited four years behind David Greene. Shockley leads Georgia to an SEC championship in 2005 and then it looks like Cox will get his turn. Enter Matthew Stafford in 2006 and Cox has a big decision to make. He stays at Georgia and waits his turn. There is no question that Cox can play the position. He will be a steady hand at the wheel behind what will be a good offensive line and a stable of very good running backs. But here is the question: Can Cox become an every down quarterback over the long haul of an SEC season? Is Murray, the highly-recruited freshman from Tampa, a talent on the level of Stafford, David Greene, Eric Zeier, and Buck Belue? All four of those guys not only played but excelled in their first seasons (Greene was a redshirt freshman in 2001). Does the other freshman, Zach Mettenberger, get in this mix? In my opinion the position belongs to Cox until Murray’s talent demands he be put on the field. I just don’t think that happens early. The Bulldogs can’t go to Stillwater, Okla., on Sept. 5 with an 18-year-old quarterback. Notice there’s a name missing there? Barnhart’s far from alone in overlooking Logan Gray in analyzing the Georgia QB situation. I understand the kid’s not the compelling story (i.e., he who waited, or the hot new things) of the bunch, but still. The GPOOE™’s new position coach says he’s a rock star. Sounds like a bee-you-tee-ful friendship. I went on spring break, and all I got was this lousy playbook. David Hale’s got a nice post up about “The Georgia Way” – how the Dawgs begin preparing their incoming recruits for the program. Speaking of prepping, it looks like Georgia’s not the only program claiming that its players are taking things to a new level of intensity this spring. Over at Team Speed Kills, Year2 makes a convincing case that Steve Spurrier is just another head coach now. Maybe it was a disappointing year for Georgia football, but at least I’m not asking this musical question. Today’s most creative argument for why college football needs a playoff award goes to Ken Goe of The Oregonian: SEC fans care about their football teams more than Pac-10 fans do, which means that Pac-10 schools get placed in lousier bowls. And that inequity can only be fixed by – you guessed it – a playoff involving at least 20 schools. And Chris Brown weighs in on what, if anything, Matt Stafford’s high score on the Wonderlic means (answer – probably not much). Honestly, though, just check it out for the killer lede.